Kent Russell explores multiple, often bizarre manifestations of American masculinity in addition to his own. As Jonathan Chait outlined recently in a timely and widely-shared piece for New York Magazine ("Not a Very P.C. Thing to Say", 27 January 2015) political correctness has stifled many important cultural discussions and debates about what it means to be a man in the 21st century. In this unprecedented new era of “Gotcha!” politics, it’s often controversial to raise the question of what it means to be a modern man, as what Chait describes as the "language police" race to see who can take offense the soonest the moment any topic associated with gender is raised. Thus, the title of Kent Russell’s newly-released collection of essays—I Am Sorry to Think I Have Raised a Timid Son—immediately caught my attention. Any man with the cajones to explore, and discuss openly, his experience of maleness and masculinity in the 21st century is granted my immediate respect. What’s more, I can think of few more hurtful things a father could call his son than “timid” (even in jest), and thus, found myself feeling something-approaching sympathy with the book’s author before turning a single page. Throughout I Am Sorry to Think I Have Raised a Timid Son, Russell explores multiple, often bizarre manifestations of American masculinity in addition to his own, including the Insane Clown Posse-worshipping juggalo scene, the cult of the warrior in professional ice hockey, and even Amish baseball-enthusiasts. If there is a running theme in this book—and I think there is—it's the author’s struggle to capture these people and places fully without apologizing for them, and their brand of often-bizarro cultural politics, while at the same time trying desperately, often pathetically, to “fit in”. With the former aspiration, Russell succeeds; with the latter, he does, and indeed should, not. Nowadays what used to be called “participatory journalism”, or “the new journalism”, is commonplace in nearly all print media outlets, from dinosaurs like the New York Times to upstarts such as Buzzfeed. Thus, distinguishing yourself as a contemporary “participatory journalist” is not easy. Russell’s literary affliction is common to many of his generation who attempt to write in this genre (and I indict myself equally): that is, a tendency to over-describe, and insert oneself in the story when the first-person voice serves no real narrative purpose. Somewhere, somehow, someone needs to save participatory journalism from itself, lest we all succumb to collective navel-gazing. Still, when Russell is good he is very good. The highlight of I Am Sorry to Think I Have Raised a Timid Son is its premiere essay, detailing Russell’s relationships with his cantankerous Vietnam-vet father, and his best friend, freshly home after an extended stint in Afghanistan. Most men who are honest with themselves have felt the call—at some time or another—to serve their country in uniform, and any man who chooses to neglect that call is faced with some form of self-doubt years down the road. It seems that Russell is no different. Russell’s essay detailing the struggles of his father and friend is sharp, unsentimental, deeply moving and insightful. Unfortunately, the book goes downhill from there. 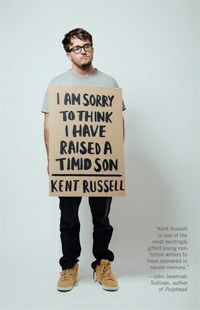 It’s not that the rest of I Am Sorry to Think I Have Raised a Timid Son isn’t a fun, often engaging read. It is, especially when the book gets to the warped, though often-misunderstood vices of juggalo-land, or an afternoon spent with pro hockey’s most legendary (though greying) enforcer. There's a more than a hint of the guiltily-voyeuristic throughout this book, and the author seems to feel genuine empathy, and often admiration for his subjects. Above all, the pages of I Am Sorry to Think I Have Raised a Timid Son represent the sound of a young writer finding, and occasionally discovering, his voice, and though the book would have benefitted from greater editing and collation, there are more than a few worthwhile moments throughout. However, the fact remains that Russell's prose feels scattered and disjointed much of the time. A recurring motif is the author's complex relationship with his aforementioned father, who is easily the book’s most entertaining character. But when we are re-introduced to this relationship at various points, it can be disorienting for the reader who is trying to get an emotional grip on the other characters and stories contained in these essays. After the impressive introductory chapter, for the remainder of the book I hungered for better thematic flow, and was consistently disappointed. Still, this debut effort shows promise, and with some serious self-censorship and a pseudo-fascistic editor, I have little doubt that Russell has the potential to create something of greater cohesion and consequence moving forward.